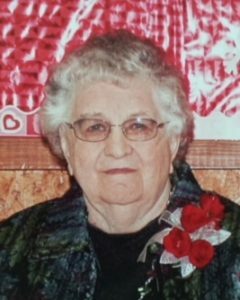 Dorothy Vondra, 87, of Schuyler, died Monday, December 11, 2017, at her home. Mass of Christian Burial Thursday, December 14, 2017 10:30 A.M.
Committal in Schuyler Cemetery at 1:30 P.M.
Dorothy was born January 8, 1930, near Clarkson, Nebraska to George J. and Bessie (Janousek) Blum. She attended area schools and was a member of Holy Trinity Catholic Church of Heun. On February 21, 1950, she married Ladislav Vondra at Heun. They lived and farmed north of Schuyler until retiring in 1991. Lad died in 1992 and Dorothy moved to Schuyler in 1993. She enjoyed quilting, playing cards and visiting with friends at the Senior Center. Dorothy especially loved spending time with family and grandkids, cooking, baking and caring for her flowers. She was a member of Divine Mercy Parish in Schuyler and the Schuyler Eagle's Club. Dorothy is survived by two sons; Gene (Jean) Vondra of Milford and Gary (Ronda) Vondra of Fremont, a sister, Judy (Larry) Anding of Albion, brother George Blum of Fremont, 10 grandchildren, 26 great-grandchildren and 4 great-great-grandchildren and several nieces and nephews. She was preceded in death by her parents, husband Lad and daughter and son-in-law Linda and Don Marker.